Technically speaking, aeration is the naturally occurring process of air exchanges between the soil and its surrounding atmosphere. Practically speaking, aeration is the process of mechanically removing small plugs of thatch and soil from the lawn to improve natural soil aeration. 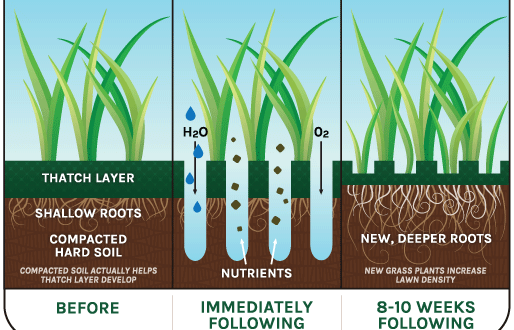 Aeration reduces soil compaction and promotes root growth for healthier grass. Spring and fall are ideal times to aerate. Most lawns only need to be aerated once a year.